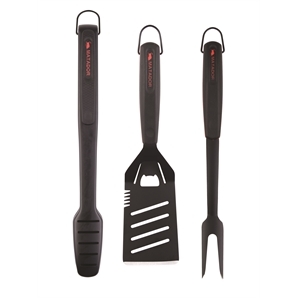 The Matador 3 piece BBQ Tool Set has been professionally designed, incorporating unique design features to provide an enhanced barbecuing experience that you’ll want to share with friends and family. A premium non-stick coating has been applied to your Matador stainless steel BBQ tongs, spatula and fork, for superior performance and enhanced aesthetic appeal. The tools also feature a comfortable Ergohex handle design, and a hanging hook for easy storage and accessibility.